The Mile End is one of the most artsy neighbourhoods in North America. With such a high concentration of original activities, vibrant characters, and creative outlets, picking the right things to do for your Mile End itinerary might be a challenge. Take a look at our top picks for a few hints. The Mile End is a 10 block neighbourhood conveniently sandwiched between Le Plateau du Mont-Royal and Little Italy. Despite its small size, this neighbourhood is a microcosm of all the best parts of Montreal. A community primarily based on excellent coffee, enviable fashion and underground artists. Can you think of anything better? This sector is a melting pot for musicians, artists and a community of Hasidic jews. All these unique lifestyles manage to live parallel to one another, shoulder to shoulder, making for a unique district. 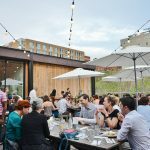 To give you a tour, we’ve put together a list of local favourites that offer the best “Mile End Montreal Experience”. Inside Green Panther, 160 Saint-Viateur E.
Not only is Mile End saturated with vegetarian options, but a few vegan restaurants chains have taken root in the area over the last few years. Check these spots out to find out why they’re all the rage in this city. Our recommendation for your mandatory trip to Fairmont street is the following: stop by La Dhrogeria Fine for some homemade gnocchi, served with what is arguably Montreal’s best pasta sauce, la salsa de la nonna. The owner serves these out of a walk-up window where you can order your gnocchi to go. Then, savour this saucy delight on one of the many benches that line Fairmont. Finally, end your delicious adventure next door at Kem Coba, the artisanal ice cream shop that’s so popular there’s a Twitter account dedicated to the length of its lineup. Bonus: Now that you’re nice and full, you can venture into Fairmont Bagels, and grab a dozen to bring back home, or maybe just one, so you can sample St-Viateur’s favourite bagel rival. A local artist performing at Café Dépanneur, 206 Bernard W.
Inside Drawn & Quarterly, 211 Bernard W.
Take a Mile End Food Tour! Kem Coba ice cream being enjoyed outside Kem Coba on Fairmont ave. Whether it’s because you’re strapped for time, or because you’re the kind to enjoy a cavalcade of food and culture, or maybe because there aren’t many ways to experience 6 food stops for about 55$. The Mile End Food Tour is an amazing deal and the perfect way to spend 3 hours in the Mile End. Stopping at St-Viateur Bagel, The Green Panther, Kem Coba ice cream, even the Rialto… It covers the culinary as well as cultural essentials while a guide tells you about the area’s history, and quirky tidbits. A must-try! Read about it and book your tickets here. Dieu du Ciel terrasse, 29 Laurier ave W.
Café Olimpico, 124 St-Viateur W.
St-Viateur is perhaps the most quintessentially Mile End street. Vintage clothing stores, eateries, coffee shops, handmade benches… it’s all here. Community spirit takes on the form of furniture with the Givebox, a tall wooden armoire where people leave what they no longer want for others to take. One man’s trash is another man’s gold, yes? Find it right outside Latina’s grocery store, on St-Viateur and Waverly. The much talked about St-Viateur Bagel shop is a must. This bagel institution is a favourite amongst locals, celebrities, and Mr. Anthony Bourdain himself. Come find out what the buzz is about! And if you really want to get into it, cross over to Fairmont bagel and compare! Which one wins the infamous bagel war? Wake yourself back up from your carb coma by taking part in another war, the coffee wars. Café Olimpico on the corner of St-Viateur and Waverly has been said to serve up the best Italian cappuccinos, but so does the Social Club, only one block away. In the summer, locals flock to both of these joints’ terraces to get caffeinated and enjoy the sun, the breeze, and the Mile End vibes. Arts Café: This spot has a part bohemian, part hip café vibe and is perfect to extend that hazy morning feel way into the outdoors. Rustic decor, neighbourhood vibes, art books and manifestos on the walls.. come enjoy one of their many perfected menu items: shakshuka, bagel sandwiches, scones and jam… it’s a menu made with love and it shows. Fabergé: This one’s a more decadent, artery clogging option, but it’s done right. Known for their Benny Mac (mac ‘n cheese eggs benedict, yes), their chicken and waffles plate…oh and their Nutella crepes. Come equipped with a severe calorie deficit and eat your little heart out. Hof Kelsten: A smidgen past the Mile End border, you’ll find Montreal’s darling bread maker, Hof Kelsten, right on the Main. The vibe here is inevitably trendy, but inspires an eat-and-go type meal (you won’t find cushioned seats and romantic candles here, but rather a low-key industrial look, where food is the centerpiece). Snag some pastries to go, and gobble down French toast, eggs, meats… all with the Hof Kelsten signature Jewish and Eastern European twist. Swinging by the Mile End mid day? Make sure you’re hungry and indulge at one of these eateries. Larry’s: Lawrence restaurant’s little sister, Larry is the new kid on the block that the Mile End has welcomed with open arms. Come here for outstanding coffee and a tapas-style lunch. Brooklyn: Ah, Brooklyn. A charming wooden back patio gives it that authentic neighbourhood vibe, and yet the place remains quite sophisticated. Perhaps it’s their retro furniture for sale section? Here you’ll find locals and workers on their lunch break, savouring Brooklyn’s delicious and varied menu. Le Champ des Possibles (local’s secret): OR, you can do like the locals and picnic in Le Champ des Possibles! This park is a community-driven project: volunteers maintain it and advocate for it. That’s like having a picnic right in the middle of the big beautiful heart of the Mile End. Are you around the area later in the evening? Have a look at our blog article, Mile End Montreal Best Restaurants for a complete list of our scrumptious dining recommendations! Ping Pong Club: Ping Pong Club is pretty much what you’d expect for a Mile End spot by its name: a resto bar with ping pong tables, a hip vibe, and a menu filled with comforting options. Their mac and cheese balls, alphabet soup, and milkshake will cheer you and your friends up along with a game of babyfoot or Jenga. They also have a fully stocked bar, and many slush versions of their cocktails. A definite must-try. Le Marché des Possibles is a community space and park in the Mile End that’s maintained by locals. Revamped a few years back, it is now a space that holds cultural events throughout the summer, such as shows, BBQ’s, markets, and more! It’s a lovely way to bask in the summer sun and let the neighbourhood love you a little. Check out their program here.